What Do the Japanese Call Their Grandmothers? The Japanese word for grandmother is obaasan, sometimes shortened to baasan or baa-baa. Since the Japanese language uses a different alphabet from English, these terms are transliterated and may exist in many different spellings. Variant spellings include obaachan, oba-chan, obachan and baachan. One's own grandmother is called sobo or soba. Some Japanese children call their grandparents by the nicknames Jiji (from ojiisan) and Baba (from obaasan). Unlike grandparents in many other Asian cultures, the Japanese do not have different names for maternal and paternal grandparents. Most marriages in Japan today are "love marriages," not the arranged marriages of the past. Modern Japanese families look much like modern American families. 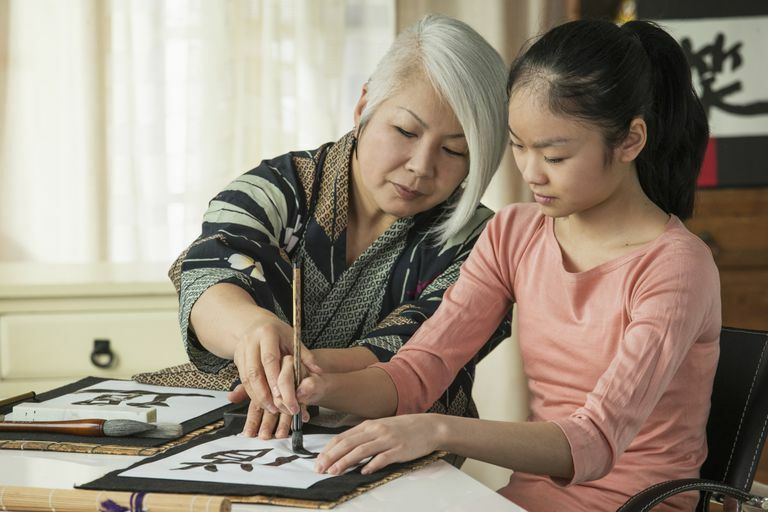 Most live as nuclear families, sometimes with a member of the older generation living with them, but traditional Japanese culture was very different, with up to five generations living together in very large, very stable family groups. Although most Japanese have changed the way they live their daily lives, the influence of the past is still very pervasive. Child-rearing is very important to the Japanese, and it typically consumes much of a mother's time. Traditionally, fathers have not been very involved in child-rearing, but that is slowly changing. Children are regarded as raw material to be shaped, and much energy is devoted to the task. The constitution of 1947 provided for gender equality, but vestiges of the old male-dominated system remain. Women, for example, are expected to speak more formally and less forcefully than males. For a number of years now, many young people in the United States and in other countries have become enamored of Japanese popular culture. It's such a noticeable phenomenon that it has spawned the Cool Japan project, a joint endeavor of MIT and Harvard. The movement may have begun with the popularity of manga, the Japanese comic books that have a distinctive format and style. Soon fans also embraced anime, animated film that was sometimes based on manga. Now a trip to Japan is on the wish list of many American teens, many of whom also listen to J-pop (Japanese pop) and dabble in Japanese language study. What does this mean for non-Japanese grandmothers and others? A grandchild's special interest can be an avenue for grandparents to get involved. These ideas and resources might help. Celebrated on January 1, this holiday is celebrated with the eating of "year-crossing noodles," which are simply extra-long noodles made of buckwheat. Substitute your own noodles, but keep the fun name. Another tradition is the serving of symbolic foods in layered boxes called juubako. The foods are prepared to last for several days so that the women don't have to cook. Instead of this elaborate option, New Year's is a great time to introduce the grandkids to Japanese bento. Children love the bite-sized fun and fun shapes that are traditional in bento. Another New Year's tradition is the giving of envelopes containing money to young children. Most grandparents are happy for any excuse to give money to the grandchildren. Observed on May 5, this holiday is celebrated with sweet desserts made of rice, often cooked in leaves. You can skip the leaves and make chi chi dango mochi with the grandchildren. Carp flags were traditionally flown to honor the boys in the family. You can replicate this custom with this flying carp craft, or try an origami Japanese lantern. Whether you go by grandma, an obaasan or some other name, take time to enjoy your mago (grandchildren)!